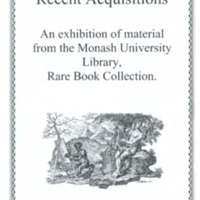 The exhibition was held in the Rare Books Exhibition space, Sir Louis Matheson Library, Monash University from 13 December 2001 - 6 May 2002. The exhibition highlights acquisitions by the Rare Book Collection and looking at it is a good way to gain an idea of the breadth of the Rare Book Collection. There are examples of 17th and 18th century works as well as publications from the 19th and 20th centuries. Among the items on display we find artist's books, one in the form of a box of cakes, another presented like a box of chocolates. There are also manuscripts, including two hand-made children's books produced in Melbourne in the 1940s. Some Australian classics are featured, for example, a first edition of The Magic Pudding. More recent publications displayed included women's magazines such as Australian Women's Weekly.